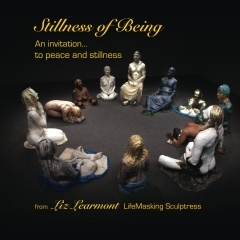 is a stunning 30 year retrospective journey through the Life-Masked Sculptures created by Liz Learmont. As Liz captures the breathing essence of life in her works she narrates her creative excursion. This book offers an intimate journey through the evolution of this unique art form with over sixty magnificent images and personal commentary by the artist. ​covers 30 years of LifeMasked Sculptures. ​covers 25 years of LifeMasked Sculpture. invites you to take a moment with yourself to be in peace and stillness. This enthralling photographic expression features an installation of stunning LifeMasked meditational figures inspired with 9/11. invites you to experience a moment of peace and stillness.